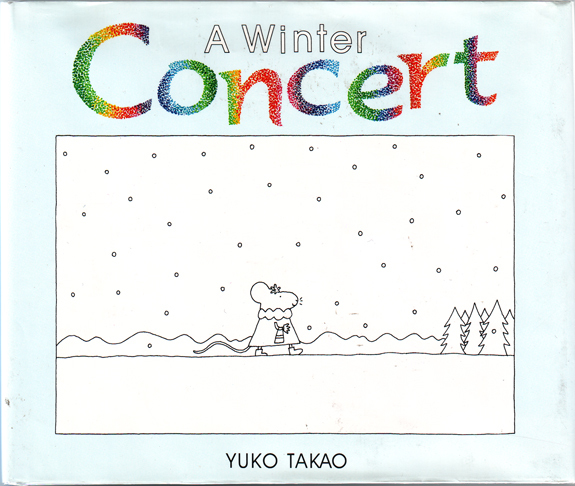 As we celebrate the birthdays of Mozart (255th) and Lewis Carroll (179th) amidst threatened cuts to arts funding, we might re-read Yuko Takao’s A Winter Concert (1995; English translation, 1997). Rendered in thin dark lines on a white background, mice walk to a concert. As the pianist begins to play, colored pointillist shapes rise from the piano: a small red circle, a smaller orange triangle, a purple square. Displaying the piece’s musical development, the shapes, sizes and colors grow in frequency and variation: a crescent moon of yellow, orange, and red; a globe of many colors. Soon, a full spectrum of sound washes over the auditorium. When the audience departs, each member brings along some of that color on the journey home. Music adds color to our lives. It brightens cold winter days. It allows us to experience beauty. Despite what the Governor of Kansas may think, the arts deserve our support. And I, for one, am glad to pay more taxes, if that’s what it takes. As the protagonist of Leo Lionni’s Frederick (1967) knows, art can sustain us when times are hard. And, despite news of economic recovery, times remain hard. In order to live, a person needs two pennies: one for a loaf of bread, and the other for a lily. If you just have the first penny, you’re merely surviving. The second penny — the one for beauty — is what allows you to do more than merely survive. The second one allows you to live. Support the arts. If you need a second penny, take mine.